Eva Miranda is a Full Professor in Geometry and Topology at Universitat Politècnica de Catalunya, Doctor Vinculado at ICMAT and Chercheur affilié at Observatoire de Paris. She is the director of the Laboratory of Geometry and Dynamical Systems at UPC and the group leader of the UPC Research group GEOMVAP (Geometry of Varieties and Applications). 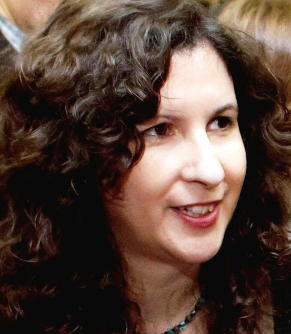 Since May 2018 she is a member of the Governing Board of the Barcelona Graduate School of Mathematics. Her research is at the crossroads of Differential Geometry, Mathematical Physics and Dynamical Systems. Her area of expertise is Symplectic and Poisson Geometry. She works with objects appearing on the interface of Geometry and Physics such as integrable systems and group actions acquainting for symmetries of the systems. Her research deals with geometrical and dynamical aspects of the singularities arising in Symplectic and Poisson manifolds as well as with mathematical models for their quantization. She has been distinguished with an ICREA Academia Prize in 2016 and a Chaire d'Excellence de la Fondation Sciences Mathématiques de Paris in 2017. She is also an active member of the mathematical community as member of international scientific panels and committees. She served as the EMS-SCM corresponding member in 2011-2017 and since 2017 she is a member of the Scientific Advisory Board of the CRM-Barcelona. Victor Guillemin, Eva Miranda and Jonathan Weitsman, On geometric quantization of b-symplectic manifolds, Adv. Math. 331 (2018), 941--951. Anna Kiesenhofer and Eva Miranda, Cotangent models for integrable systems, Comm. Math. Phys. 350 (2017), no. 3, 1123--1145. A. Kiesenhofer, E. Miranda and G. Scott, Action-angle variables and a KAM theorem for $b$-Poisson manifolds, J. Math. Pures Appl. (9) 105 (2016), no. 1, 66--85. Victor Guillemin, Eva Miranda and Ana Pires, Symplectic and Poisson Geometry on b-manifolds, Adv. Math. 264 (2014), 864--896. Eva Miranda, Philippe Monnier and Nguyen Tien Zung, Rigidity for Hamiltonian actions on Poisson manifolds, Adv. Math. 229 (2012), no. 2, 1136-1179.